Join Our Exclusive Online Wisdom School! Make Awakening & Self Realization Part of Your Daily Life. you will learn practical methods for awakening your higher consciousness. Fresh Content New content is added daily so you can make new discoveries every day. Library Access a wealth of materials from Guy Finley’s books, notes, audio recordings, and videos. Study Groups Participate in a weekly online discussion group with other seekers who are eager to share their insights and discoveries. Discussion ForumPost a question or observation in an existing thread, or start a new one. Guy’s Blog Read Guy's newest unedited, and uncensored, writings on a broad range of subjects related to the inner Path. Courses Complete spiritual courses provide insight and practical exercises to help you dive deep into yourself and discover higher love, a quiet mind, true confidence, and healing wisdom. Daily Meditation Emails Get inspired by short and powerful Higher Wisdom insights delivered straight to your inbox every weekday. Q&A with Guy Have Guy Finley answer your questions about the inner journey. Try it Risk Free for 30 Days! Get BIG savings by paying annually! New material is added regularly to the site as Guy Finley constantly produces new writings and talks. Insightful, stirring, and easily accessible 3-20 minute blog-style audio clips, recorded live during Guy Finley's ongoing classes. Enlightening articles by Guy Finley address practical life issues and how to apply spiritual principles to every day problems. Get quick inspiration anytime. Let us choose for you. It will always be something uplifting, thought-provoking, and enlightening. Read observations and experiences posted by members, along with feedback from fellow members. Build your own online archive of your favorite Guy Finley materials. Keep track of Guy Finley books, talks, and albums you would like to purchase, and share it with your friends. Access our full collection of insightful and stirring 3-20 minute blog-style audio clips, recorded live during Guy Finley's ongoing classes. Dive deep into a subject on your own! Work at your own pace with a series of easily accessible talks by Guy on important topics. Guy's personal correspondence with seekers addresses questions many students have. Hear delightful interviews of Guy by hosts from around the country. A new, special Guy Finley talk selected each week for in-depth study helps you be part of our ongoing school. You are not alone on the inner journey. Join a lively online discussion with others members each week of "This Week's Topic." Dive deep into a subject on your own! Work at your own pace with a series of more advanced talks by Guy on inner-life topics. Open online Q&A sessions with Guy, often including members of our global community who send in questions, or speak directly with Guy. Submit your questions directly to Guy. Take an active part in the Forum, writing your observations and experiences and receiving feedback from fellow members. Local longtime members speak on a special topic for 10 to 15 minutes. Hear the explorations and discoveries of others on the inner journey. Before each meeting students give brief reports on their inner-life discoveries working with class principles. Stirring performances of sacred music by the Life of Learning Choir and ensembles. 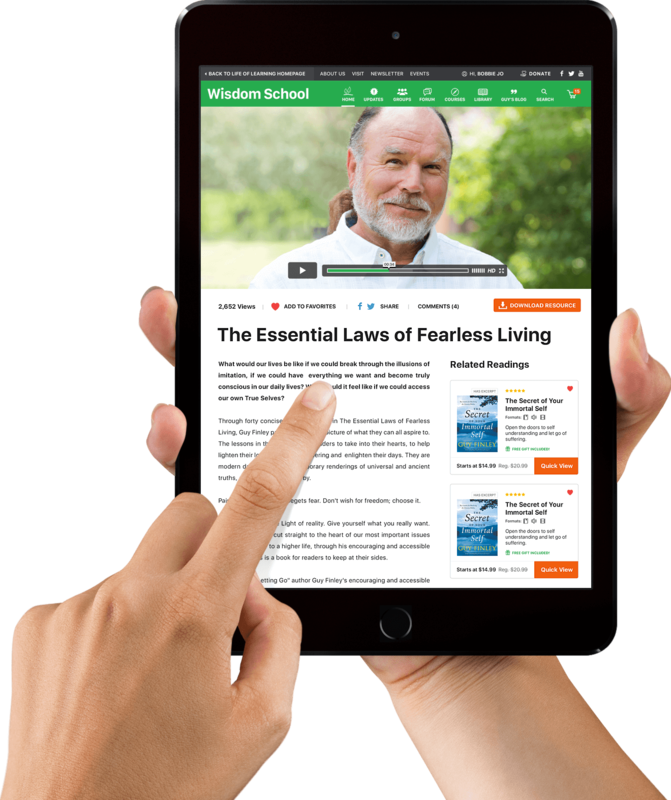 Complete access to every writing, audio, and video in our Wisdom School archive. Select classes are live-streamed (including Guy's talk, live music, and student reports). Watch in real time and be part of it all. Some powerful, advanced talks are reserved for All-Access members only! Open, informal discussions where local members share their discoveries and Guy's comments deepen everyone's understanding. Dive deep into a subject on your own! Work at your own pace with a series of advanced talks reserved for All-Access members only! Read Guy's newest insights as he jots them down, spontaneous and uncensored. Exclusively for All-Access Members, allows you to view Saturday discussions live, communicate with other serious students, and more. *All Plans come with a 30-Day Money Back Guarantee. Automatic monthly billing to your credit card. No Obligation. Cancel any time for a pro-rated refund. How will I benefit from being a member of this site? If you have ever tried to make positive changes in your life by reading books, buying audio or video programs, or attending seminars, you know that all of these ways of learning provide temporary inspiration, but that their power usually fades away after a few days or weeks — leaving you back where you started. There is no way around it: It takes a consistent effort to make real and lasting changes in your life. It requires a continuous flow of new higher knowledge and impressions, and constant reminders to persist with your intention for inner-growth. This Online Wisdom School provides both of these key ingredients. It will help you to change in ways that books, CDs, DVDs, and seminars just can't. Do I need any special experience or background? The simple answer is: no. That's the beauty of these teachings — you start where you are, as you are, right now. All it takes is a willingness to take the first step and then you will literally find that the path unfolds from within you. How often do you update the membership site with new material? The site is updated almost every single day with new content. Each week we post at least two hour-long talks by Guy and a 45-minute student Q&A with Guy, plus any number of writings, short podcasts, interviews, etc. as they become available. We even post talks by longtime students as well as music by our choral groups. Our members say that if anything, there's too much material! But we want you to have the option of experiencing the full outpouring of wisdom as if you were here studying here in person at Life of Learning Foundation. Do you offer scholarships or free memberships? Yes — as Life of Learning Foundation is a nonprofit organization, our primary mission is not to make money by running the website, but to make it accessible to as many people as possible, especially in times of hardship. Please visit our Contact Us page to send us your information and we will work with you on an individual basis to ensure that you gain access to this life-changing resource. "WOW! (...)I am very grateful for this gift, and the opportunity to get a more in-depth grounding in all this...and I will not squander the chance to get some sound advice and guidance. Thank you once again." Mr. Guy Finley, I would like to take this occasion to express my sincere gratitude to you. Your teachings...have helped me to sustain so far through a few major crisis in my life, and also to become a better human being." "Listening to Guy's messages has put my life purpose and who I am into perspective. My relationships have improved, beginning with the relationship with my true self...I have been a seeker for many years and God has led me to Guy at a time of my life when I needed it most." "My thanks for keeping the material so affordable and available to all. It is hard to put into words just how much this is helping, and I feel very blessed to have found this material that Guy is sharing. Just wonderful! Many, many thanks." "There are so many voices out there talking loud and saying nothing. I thank God for your voice and the love and passion as well as compassion for humanity to gain the know how in really living a life of freedom in every since of the word."